November 12, 2015 – IK Multimedia is proud to announce that iRig®, the best-selling mobile interface of all time, is going acoustic! Introducing iRig® Acoustic, the first acoustic guitar mobile microphone/interface specifically made for acoustic guitars. Inspired by a must-see documentary on flamenco guitar master Paco de Lucia, iRig Acoustic is an innovative and extremely compact patent-pending clip-on acoustic guitar microphone/interface for iPhone, iPad, iPod touch, Mac and Android. iRig Acoustic features advanced miniature microphone technology, which gives it a rich quality of sound that beats piezo and magnetic pickups and rivals professional-grade studio microphones at a price that’s much more affordable. It installs (and uninstalls) in seconds: It simply clips onto the rim of a guitar or ukulele’s sound hole. iRig Acoustic also features monitoring and line-output capabilities for recording and performing live. The best way to reproduce the sound of an acoustic instrument is to place a high-end microphone in just the right spot in front of the instrument. When used with AmpliTube Acoustic, iRig Acoustic can perfectly replicate the sound of that ideal microphone placement. It’s able to capture the full-frequency range, tonal character, complex harmonics and overtones of acoustic guitars. It achieves this professional-grade sound quality thanks to its advanced MEMS (MicroElectrical-Mechanical System) microphone technology. 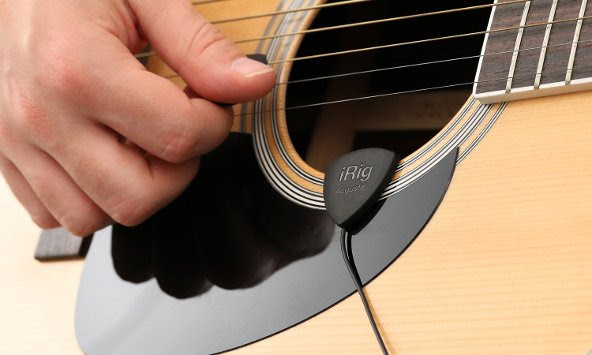 Its omnidirectional polar pattern lets musicians place the iRig Acoustic just inside the sound hole – a position that allows their microphone to pick up a detailed and focused sonic output. AmpliTube Acoustic’s calibration process analyzes and optimizes the guitar’s unique frequency response to pick up the best sound from their chosen guitar. These technologies combine to capture the complete picture of an acoustic guitar with every sonic vibration represented. This differs from piezo-electric pickups and magnetics that just capture the vibrations of the body top or strings. With this powerful calibration feature, iRig Acoustic delivers portable sound on par with high-quality studio microphones. iRig Acoustic is a compact and light mobile interface that easily clips onto any acoustic guitar. And because it clips on, players can enjoy consistent professional quality sound while freely moving around on stage or in the studio. This is virtually impossible to do with a traditional acoustic mike setup that involves a condenser microphone statically placed at the “sweet spot”. iRig Acoustic delivers the best of both worlds: It provides the big picture sound of professional studio miking plus the freedom of mobility. iRig Acoustic’s ease of use extends to its audio output. It easily plugs into any iPhone, iPad, iPod touch, Mac or Android device’s headphone/input jack via a standard 1/8″ TRRS cable. It also sports a female stereo output jack placed on the in-line cable that can be used with headphones for practice and monitoring. This same jack can even be used as a line-out to send a signal to a mixer or power speaker for practice and live performance. iRig Acoustic is designed to work with the new AmpliTube Acoustic app. 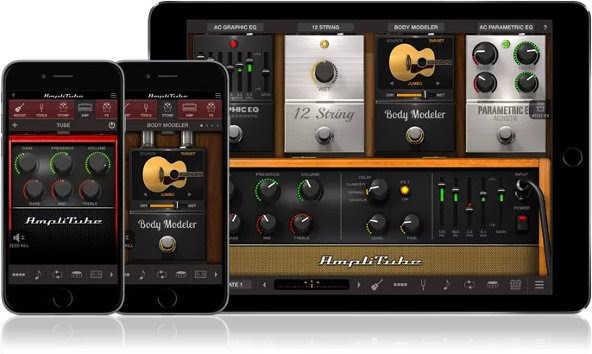 AmpliTube Acoustic is the latest addition to IK’s famous AmpliTube family of guitar and bass tone studio apps and software. The AmpliTube Acoustic app features a setup and calibration process that optimizes iRig Acoustic to match the response of the miked acoustic guitar. iRig Acoustic is then able to capture and reproduce the true sonic character of the selected guitar with sound comparable to a properly placed, large-condenser studio microphone. Users create and save optimization profiles on their device for every guitar (or ukulele) they own or use. They can then recall profiles with a simple touch on the screen when switching instruments. Designed specifically for acoustic playing and recording, AmpliTube Acoustic features 3 acoustic amplifier models: two solid state amps and one that’s tube driven – all of which feature gain, presence, volume and 3-band EQ controls as well as amp-specific effects that range from delays and flangers to spring reverbs and choruses. In addition to the amps, AmpliTube Acoustic also sports a spread of creative acoustic stompbox effects that can be used in the acoustic signal chain along with the amplifiers: there’s an acoustic graphic EQ, acoustic parametric EQ, acoustic compressor, a “12-string” emulator, a “Bass Maker” octave pedal, a feedback notch filter “Feedback Killer” and even a “Body Modeler” that lets users transform the sound of their acoustic into a different style of guitar. iRig Acoustic comes with AmpliTube Acoustic FREE, which features a solid state acoustic amp with built-in effects, the “Feedback Killer” effect, a built-in single-track recorder and more.